CleanMyMac from MacPaw is an all-in-one macOS solution designed to keep your Mac clean and to secure space from your computer’s hard drive. It’s even better with version 4.4.0 thanks to the edition of the Space Lens; more on that in a moment. Why do you need CleanMyMac since a Mac runs its own maintenance scripts once a day, a week and a month. However, there are still files like universal binaries, localization files, hidden trashes, and others that take lots of space and remain untouched by these scripts. Enter CleanMyMac, which prompts you to scan your Mac every month — unless you designate another schedule. CleanMyMac has oodles of features, so you'll have to spend some time checking out its nooks and crevices. However, it has a well-designed, intuitive interface so you can start using it immediately after your purchase. The post Apps to help quit smoking or cope with depression share data without full disclosure, finds AMA appeared first on 9to5Mac. The post Bowers & Wilkins unveils ultra-premium ‘Formation’ home speaker line with AirPlay 2 appeared first on 9to5Mac. Apple has been granted a patent (number 10,259,616) for an environmentally friendly paper bag. Among other things, the tech giant sees them being used at its retail stores. Here’s Apple’s summary of the invention: “Embodiments of the present invention include a paper bag that includes a bag container formed of white paper with at least 60% post-consumer content. The white paper may be formed of solid bleached sulfate. The bag may have a reinforcement insert adhered to its interior, which may extend across and strengthen a fold of the bag container. The Sydney Morning Herald reports that Apple’s bid to stop watch company Swatch using the phrase “one more thing” in Australia has failed, despite the tech giant arguing the term was synonymous with its iconic co-founder Steve Jobs. Apple argued at an Australian Trade Marks Office hearing that Swatch should not be allowed to use its trademark over the phrase, and in turn applied for its own Australian trademark over the term. Sometimes, you need to turn a piece of paper into a digital file. Maybe you need to include a receipt, registration, or other form of proof in an online form. Or, you want keep copies of your important documents in the cloud, so they’re always accessible and safe from being lost or destroyed. Such documents are often digitized as Portable Document Format files, or PDFs. It used to be that you needed to use either dedicated hardware or a third-party iPhone app to take a photo of a document and convert it to PDF. In iOS 11, Apple added a very handy document scanner into the Notes app, and it does a surprisingly good job of capturing most documents and converting them to PDF. Because it’s not very obvious, you’d be forgiven for not even knowing it exists. Here’s how you scan, convert, and store documents with Notes. Department store giant JCPenny has dropped support for Apple Pay from both its retail stores, and its app. The post JCPenny drops Apple Pay support from retail stores and app appeared first on 9to5Mac. Struggling retail chain JCPenney has intentionally dropped support for Apple Pay in its retail department stores and through its iOS app, for reasons unknown. Sometimes the leaks get interesting. An image of the alleged iPhone XI and iPhone XI Max molds has been leaked to Chinese web site Weibo. SlashLeaks posts an image that is alleged to be iPhone XI and XI Max molds for 3rd party case production. The core hint as to the casings comes from the triple-camera enclosure, which is consistent with recent rumors that have leaked from the supply chain. As always, stay tuned for additional details as they become available. Apple is rumored to be more closely integrating macOS and iOS together with the introduction of macOS 10.15 and iOS 10.13. 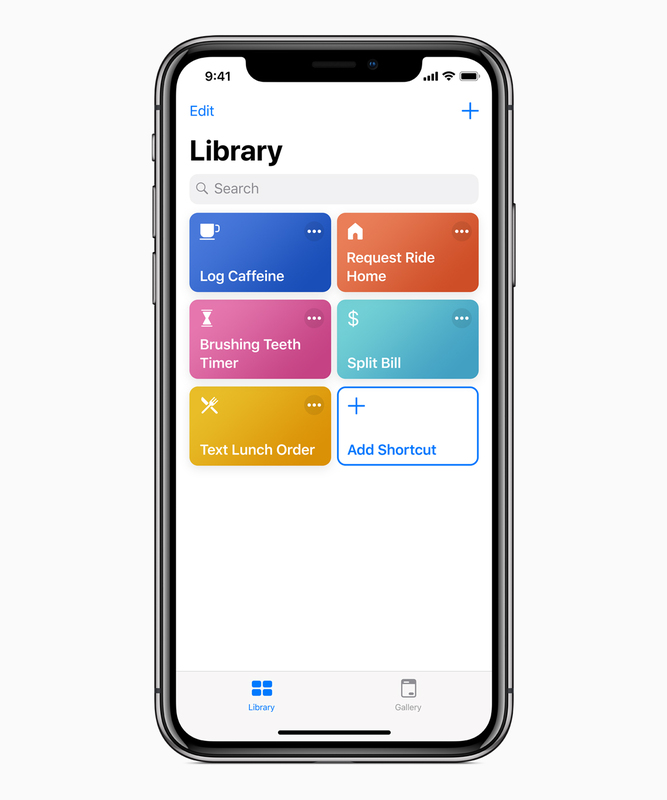 Sources have said that Apple is working on support for Siri shortcuts, a feature that debuted in iOS 12 that allows users to create custom voice shortcuts that could be activated from certain apps. It’s thought that the Shortcuts app could arrive on macOS 10.15. On iOS, the Shortcuts app is not bundled with the system, users have to download it from the App Store. It’s possible that the same will be true for macOS: users will download a Marzipan version of Shortcuts from the Mac App Store. Sources have also stated that Marzipan apps will be able to take advantage of the Shortcuts feature on macOS. Engineers are also working on bringing the assistant on macOS closer to its iOS counterpart by porting over features such as the ability to set timers and alarms and ask about air quality, currently unavailable on the Mac. Apple wants us to believe that augmented reality will be a transformative technology. I want to believe it. It sure as heck feels like it has better potential than virtual reality, which still strikes me as little more than a means of escaping the world by sticking your eyes to a sweaty box. AR, though, can add wonder to the mundane. It can provide information at a glance that we could otherwise only guess at (especially when Google Lens finally makes a full debut on the iPhone). And yes, in some cases, it can even make the world more fun. Need to quickly change your Instagram password on iPhone? Read on below for how to do it in a few easy steps. The post How to change your Instagram password on iPhone appeared first on 9to5Mac. It’s true, your two favorite geeks have come together again to have a “communal head scratch” about all the questions and problems you’ve submitted. Then it’s on to some happy tips, including one about working around the new Dropbox limitations. Download, press play, and learn at least five new things… and get your questions answered, too! The post How to create an App for iOS with no Coding appeared first on iLounge. The post iPhone 11 Dummies Gets Leaked appeared first on iLounge. Best Buy has a particularly notable 1-day sale on Apple products, including markdowns on MacBook Pro, iPad Pro, iMacs and iTunes gift cards. Free shipping is available on orders over $35 or you can go for in-store pickup. All of our top picks can be found below. The post Best Buy’s 1-day sale offers deals on iPad Pro, MacBook Pro under $1,000, iMacs and iTunes gift cards appeared first on 9to5Mac. It’s an interesting question but the deeper one might be even more interesting – does the behind the scenes footage unnecessarily glorify a particular culture? The post Best Video Converter Tools to Consider in 2019 appeared first on iLounge. You can download the new Vectornator for iPhone and iPad for free now. The post Why You Should Use A Tempered Glass Screen Protector on Your iPhone X / XS appeared first on iLounge. The post Apple loses another legal battle with Swatch, this time over ‘one more thing’ trademark appeared first on 9to5Mac. The post This week’s top stories: iOS 13 + macOS 10.15 details, Apple vs Qualcomm, iPhone camera upgrades, more appeared first on 9to5Mac. The post How To Make A Portfolio Website – Mobirise Website Builder appeared first on iLounge. The Federal Trade Commission started investigating Facebook in March 2018 as the Cambridge Analytica scandal unfolded. The investigation centers on whether or not Facebook broke an agreement with the FTC, made in 2011, that required the social network improve its privacy practices. Now, a report suggests that the FTC is specifically putting Facebook CEO Mark Zuckerberg under scrutiny as part of this investigation. The post FTC considering taking ‘direct aim’ at Mark Zuckerberg as it investigates Facebook privacy lapses appeared first on 9to5Mac. Ahead of the launch of Apple TV+ later this year, Apple continues to expand the executive team around the service. The company has now added Danielle DePalma as a marketing executive for Apple TV shows and films. The post Apple hires Lionsgate marketing executive for its growing Apple TV+ team appeared first on 9to5Mac. I honestly don’t get this need to broadcast the spoilers. Why consciously ruin the movie for other fans? Apple has been granted a patent (number 10,264,355) for a “loudspeaker cabinet with thermal and power mitigation control effort.” I’ve not noticed my HomePod running hot, but perhaps Apple is planning an even more powerful speaker. The cabinet in the patent refers to the enclosure in which speaker drivers (loudspeakers and tweeters) are mounted.The cabinet’s power level would be determined by the output of the audio signal of the loudspeaker, which I,m guessing would be the HomePod. Lemke Software has launched GraphicConverter 10.7, an update to their award-image editing utility for macOS. The app offers users the ability to convert most any format graphic file to one of nearly 80 other graphic formats. Version 10.7 brings a dehaze batch action, the ability to sort by rating and aspect ratio as well as resolution and pixel size, converting to JPEG at 75 or 85%, and more. GraphicConverter 10.7 requires macOS 10.9 or higher. It costs $39.95 and is available worldwide through the Mac App Store in the Photography category. It can also be directly purchased online from the Lemkesoft website. The Qualcomm and Apple legal battle has now concluded thanks to a settlement of unknown financial value, but as the settlement came one day in to the start of the trial, a few tidbits from discovery process have still seeped out. One particularly devious point is that Qualcomm lawyers found internal Apple emails that showed the company was specifically seeking patent licenses that were bargain deals to then use it as evidence against Qualcomm’s royalties, by contrasting the cost of each pile. AirPods got off to a slow start thanks to supply constraints. Nowadays, they are plentiful and creating an unintended social issue. John explores. Dr. Mac claims toI have found three possible options to “replace” Dragon Professional on the Mac, but these replacements include tradeoffs you’ll want to know about. We have a deal on the ChargeHub X5 Elite with Wireless Charging hub. It includes one USB-C charging port, four USB charging ports, and the top is a Qi wireless charging pad. That makes it a one-stop-shop for most of your charging needs, for $59.99. I took a few minutes at the start of this week’s podcast to rant a little about some of the mistakes Apple Music is making lately, and then I talk to Dave about all the things he considered before buying a new TV. The post LG UltraFine 4K Display currently not sold on Apple․com, stock still available elsewhere appeared first on 9to5Mac. In Wired’s latest magazine, Clive Thompson writes that for some programmers, efficiency isn’t just a way to make a job easier. It’s aesthetically pleasing. Many of today’s programmers have their efficiency aha moment in their teenage years, when they discover that life is full of blindingly dull repetitive tasks and that computers are really good at doing them. I’m not a programmer, but I’m a big fan of efficiency and optimizing my life. I don’t go as far as the “optimized self” movement, but I like to automate whenever possible. The less time you spend doing repetitive tasks, the more you can spend enjoying life. The post Logitech Slim Folio Pro review – bulky, but great for typists [Video] appeared first on 9to5Mac. Roughly 500 million iOS users have been affected by a cyberattack that takes advantage of an iOS Chrome bug. The attacks are the work of the eGobbler gang, researchers said, which has a track record of mounting large-scale malvertising attacks ahead of major holiday weekends. Easter is coming up, and the crooks are banking on consumers spending a lot more time than usual browsing the web on their phones. Another research firm says this attack can also affect Safari users. Be careful this weekend. 9to5Mac reports that Apple is working on bringing the Mac and iOS closer together with the introduction of macOS 10.15 and iOS 13. Siri Shortcuts, Screen Time, and more are expected to be unveiled for Mac during its Worldwide Developers Conference in June, the article adds, which would be good news for, among others, those interested in scripting on macOS. Apple has apparently lost interest in its AppleScript and Automator scripting solutions. In November 2016 it was reported that Sal Soghoian’s position as product manager of Automation Technologies at Apple had been terminated after nearly 20 years at the company. Despite Wisconsin’s governor wanting to change his mind on the deal, Foxconn says its still committed to the project. Andrew Orr and Bryan Chaffin join host Kelly Guimont to discuss “ownership” of eBooks, Instagram’s security, and viewing your tracked data. The ability to just raise your wrist and speak to your Apple Watch without the words "Hey, Siri," is brilliant. What was initially a convenience is now increasingly useful, too, and yet it's extraordinarily unreliable. Here's how to make it better -- and why you need it to.